The shipping industry has crowned a new winner in the unofficial race to build the world's largest container ship, boasting cleaner, more efficient transport at an unprecedented scale. In the same way an unofficial race exists to construct the world's tallest building, carriers are vying to build the world's largest container ship. It's a title which has hailed many short-lived winners in recent years, as the size and scale of transport by sea continues to grow at an accelerating rate. Container ships have tripled in size since the 1950s, but how big will they go? View past and present behemoths of the shipping industry. With a DWT (deadweight tonnage) of 191,317 metric tons, the OOCL Hong Kong has a cargo capacity of 21,413 TEU, making it the world's largest container ship. The latter is an important statistic to note, as it is the TEU that determines title honours, not its length or beam. Case in point, the CMA CGM Antoine de Saint Exupery is marginally longer than the OOCL Hong Kong (by just 13 cm), measuring a whopping 400 metres in length. That's about the size of four football pitches placed end-to-end. 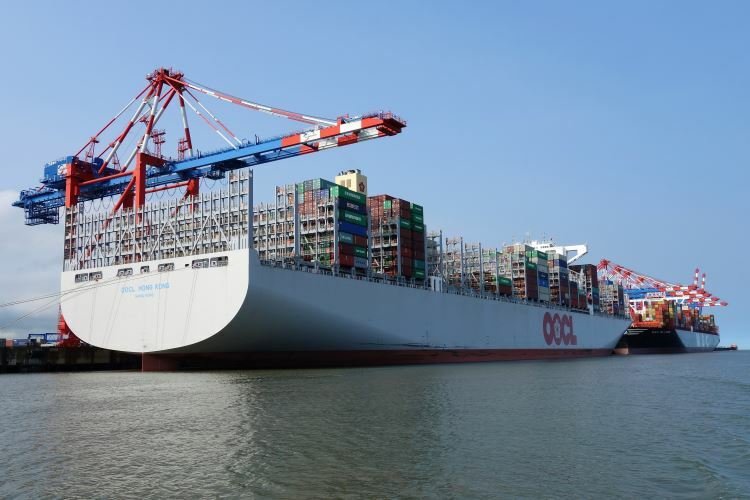 At the time of publishing this article, the OOCL Hong Kong was in transit, travelling at a speed of 15 knots between Felixstowe in the UK and Suez Port, Egypt. To be profitable it must remain in operation at all times to support expensive maintenance overheads. Economies of scale means cheaper overall transport costs. Coupled with modern, more fuel efficient engines, and an ever increasing global demand for imported goods, the world's latest behemothic container ships carry the load of three or even four cellular vessels which were once considered the pride of the fleet. CMA CGM has announced plans to build the world's largest container ships which will be capable of carrying 22,000 TEU each. They are scheduled for service from the end of 2019.